Catching up with posting on the CQ WW RTTY contest from a couple of weekends back. Overall, conditions were better then I expected, though 10m was quiet with not much activity for me. Friday night I was tired after a long week at week. That seems to be a recurring start to big contest posts for me. I need to win the mega millions to retire so I can relax all week. 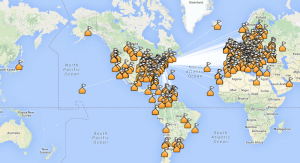 20m was active, 15m was pretty quiet and 10m had no activity. 40m was active too and the same for 80m though I wasn’t working a lot of Northeast (1 call area) stations. I ended up with 108 Qs which seems to typical with 100 Qs in a RTTY contest in the log for a Friday evening. On Saturday, I had a haircut in the morning and got on around 10:45am ET / 14:45z to find no activity on 10m but good signals on 15m to EU. Easily worked OJ0DX in Market Reef on 20m and later on 15m. I also worked UX5UO who is Gennady and the ham who did my QSL cards. 10m opened up a little before 4pm ET / 20:00z to the Caribbean and South America but it didn’t last too long. Late on Saturday I was invited to go see Billy Joel at Madison Square Garden so I went off the air not long after I worked the 10m stations. I got home late and got back on to work some stations on 40m & 80m before heading off to bed. Ended up Saturday with 312 Qs which isn’t too bad based on being off for many hours to go to the concert. I woke up rather late on Sunday and got on 40m to work a bunch of States I hadn’t yet logged. I worked 4U5F and checked them out but it looks like it counts for Italy DXCC. I caught a JA mid morning on 20m who was booming in and the only JA station I worked in the contest. I spotted OM2015TITANIC but didn’t work them, though I did work K3P which was the Pope special event station. As usual, wrapped up the contest on 40m & 80m working as many stations as possible to end up with 579 Qs in total. Of the 579 entries in the log, I logged 455 unique stations. P49X was the only station worked on all 5 bands as Ed is always loud and workable and I logged 3 other stations on 4 different bands. Log was upload to LoTW, eQSL, QRZ, Clublog and sent into the contest sponsor. Detailed contest analysis created via SH5. Thanks for the diddles!